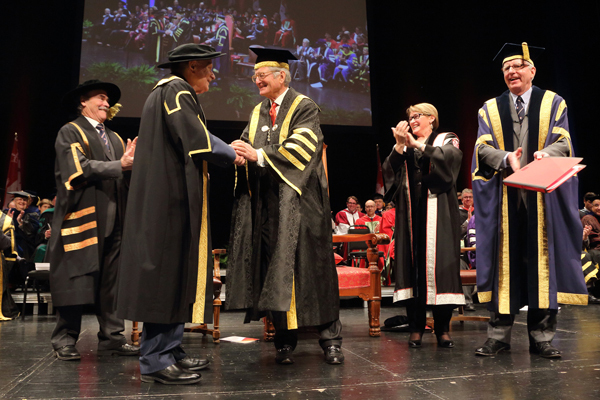 In his first-ever address to graduating students in his new role as Chancellor, Michael Meighen stressed one quality above all; service – hardly surprising for the grandson of former Prime Minister Arthur Meighen and someone who sat for over 20 years in Senate. When Michael Meighen was sworn in as McGill’s 19th Chancellor at the start of the Oct. 29 Convocation ceremonies by Stuart ‘Kip’ Cobbett, Chairman of McGill’s Board of Governors, the former Senator shook Cobbett’s hand. “I guess I can’t quit now,” he said laughing. In his first-ever address to graduating students in his new role as Chancellor, Meighen stressed one quality above all; service – hardly surprising for the grandson of former Prime Minister Arthur Meighen and someone who sat for over 20 years in the Upper House. “McGill is an institution whose graduates have gone on, like [John] O’Keefe [who was named co-winner of the Nobel Prize in Medicine earlier this month] has, to shape a better Canada and a better world. I ask you to seek to emulate their example in the years ahead,” Meighen told the crowd assembled in Place des Arts’ Salle Wilfrid Pelletier.